Of all the various plumbing appliances in your home, you probably use the sinks the most. Whether it’s your kitchen or bathroom, you likely use it several times a day to get water for a variety of uses. You likely don’t think too much about the sink itself, unless something goes wrong with it. If your sink is acting up for some reason, we recommend that you call a professional plumber to deal with it rather than trying to fix it yourself. While you’re waiting, though, here are a number of factors that might be the cause of your particular sink problems. Leaks are common in pretty much any plumbing system, including sinks. They can be caused by loose fittings, damaged seals, or even just sections of the pipes themselves that have become too corroded. While sink leaks can be small, you should never leave them to continue unabated. Even a relatively small sink leak, releasing only a few drops at a time, can waste hundreds of gallons of water over the course of a year. You don’t want to have to pay for all that water, do you? 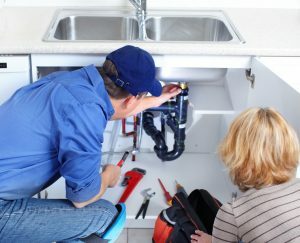 Make sure that you call for professional repairs if you notice a leak in your sink plumbing. Homes with hard water often have to deal with limescale throughout their plumbing systems, and sink plumbing is not exempt. Limescale is a type of mineral deposit that builds up in the pipes over time, restricting the flow of water through them. If it is allowed to build long enough, it will eventually harden and become much more difficult to remove. The best way to deal with lime scale is to have a water softener installed in your water line. Barring that, though, you should check your faucets and sinks on a regular basis for any white film that might be present. That’s lime scale, and if it’s in those areas it is almost certainly in your pipes. You should call a plumber to clean out your sink pipes if you notice limescale in that area. Drain clogs are common for all drains, but especially for kitchen drains because they often deal with food waste. If you have a drain clog developing, or already fully developed in your drains, don’t handle it yourself. Store bought drain cleaners use highly caustic chemicals that often cause damage to the pipes themselves. Call a professional plumber to handle them instead, and your drains will be cleaned much more thoroughly without damaging them at the same time. These are just a few of the more common sink plumbing issues that you may run into. If you notice your sink doing anything else suspicious or unusual, you should have a professional plumber check it out just to be safe. Evans Plumbing provides comprehensive sink plumbing services in Twin Falls, ID. If you need help with your sink, contact us today to schedule an appointment with one of our professional plumbers. We’ll make sure that your sinks run as smoothly and efficiently as possible.